The University of Belize through the Faculty of Management and Social Sciences (FMSS), launched its Master of Business Administration (MBA), the first Graduate Program for the 17 years old institution in December, 2017. The Tapir Room at the Best Western Plus, Belize Biltmore Plaza was packed to capacity with invited guests from the Business Community and support of members of Faculty and Staff of UB. The Director of Ceremonies, Kevin Geban, Senior Lecturer of FMSS, started the program right on time and kept things flowing in respect for those present and keeping with the aim of the Transformation Plan of UB. Dr. Bernard Watler, Dean of FMSS offered warm welcome and an introduction to what would be a very informative, upbeat event, with different perspectives of why the MBA is a great and necessary addition to the programme offering at UB. Dean Watler walked through how the 18 months, 5 trimesters, Friday evenings and Saturday Classes at the FMSS Campus in Belize City will provide what is necessary to produce a high quality MBA programme for those enrolled. He also spoke of the very attractive, competitive cost of the UB MBA Program. Dr. Watler extended gratitude to the Belize Chamber of Commerce and Industries, including Mr. Marcello Blake who was present, for their assistance with reviewing the curriculum of the MBA program and offering their stamp of approval. The Chairman of UB Board of Trustees, Mr. Harrison Pilgrim, was filled with pride as he passionately discussed how having Professor Sankat as the President of UB, for less than a year, has yielded so much forward action on the plans that has been of paper for some time. Mr. Pilgrim also applauded the entire UB team for their dedication to the transformation of the National University. The Chairman, himself a MBA graduate, spoke of the importance of this programme for leadership. Honorable Tracy Taegar Panton, Minister of State in the Ministry of Investment, Trade and Commerce, was the keynote speaker at the launch. Her address had powerful substance from a macro perspective of the significance of providing higher education with access here at home. Hon. Panton spoke of the importance of education to the Government of Belize, evident from the sizable 21% of the national budget that is allocated to education. 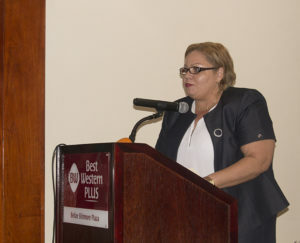 She said, “The herculean efforts of the Minister of Education, his team of advisors, educational professionals must be applauded.” As a part of the Ministry responsible for Investment, Trade and Commerce, she explicated that there are numerous times when companies and agencies are forced to seek human resources outside of Belize to fill key positions required because the expertise is not available within the country. Honorable Panton explained, “A carefully designed Master’s Degree program in Business Administration that seeks to address developmental needs of a growing economy to provide the requisite exposure and tools that will help us to navigate an ever changing, more complex world of international trade and commerce is instrumental to expanding reach, improving competencies and competitiveness while creating new opportunities for business facilitation.” Honorable Panton got applause from the audience when she shared her personal family history of her grandfather who was a stevedore and a grandmother who had no formal education, who together nurtured 7 children, the eldest of whom was her father. She continued on saying that her father believed in education as a way to achieving personal goals. He was able to become fulfill his dreams and improve the quality of life for his children by offering the opportunity of higher academic learning to each of them. She emotionally listed how herself and each of her siblings are now positive contributors to the community. 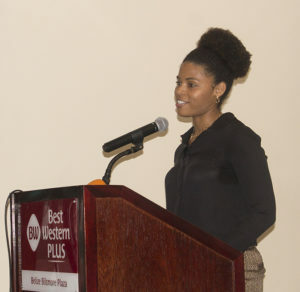 She said, “To the UB team, your collective and individual efforts will help us to challenge the status quo and improve Belize’s competitiveness. To each student, make the most of opportunity you are given. 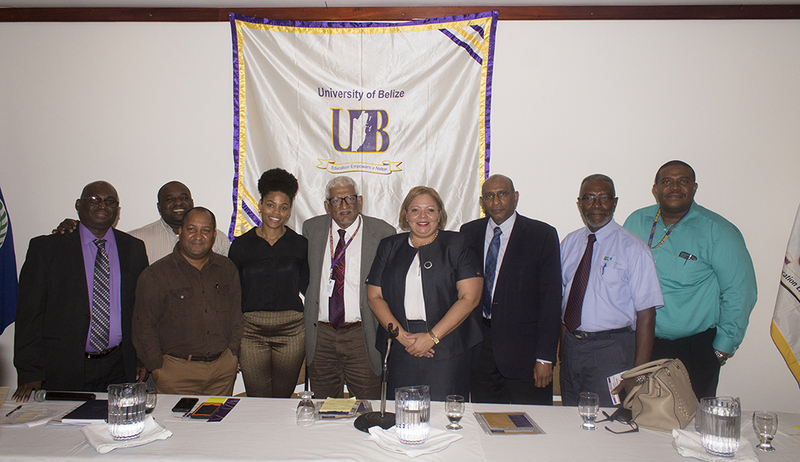 Work hard, think critically and take risk.” She ended off by congratulating the University of Belize for launching an MBA program to bridge the gap between the opportunities and the available expertise for Belize. UB’s Vice President Mariot Simon offered special thanks to all persons on the panel, to Reverend Papouloute who did the invocation and especially to everyone who took time out to attend the momentous event. Kevin Geban then opened the floor for questions where Dr. Palacio and Chair of FMSS, Gilroy Middleton joined the panel to provide more insight and responses on the MBA program. The mixer then allowed for persons to mingle and have discussions about the MBA program while enjoy Viña Maipo Wine courtesy of GraceKennedy (Belize) Ltd.
More information on the UB MBA is available at the University’s website ub.edu.bz. President Sankat congratulates Dr. Bernard Watler, his team and everyone who turned the dream of a UB Graduate Program to a reality.